These goat-like animals live in the Himalaya’s of India,Nepal, Bhutan, Tibet, and Pakistan. Once thought to be sheep, recent studies of their DNA shows that they are more closely related to goats. They’re masters of disguise! Using their grey-ish coat colour to camouflage against rocky slopes and cliffs. They rarely stray further than 200m from a cliff as they use them as an escape route from predators. They are sure-footed climbers, able to move rapidly around the rocky, precipitous terrain of the Himalayan mountains. They generally avoid entering forests as they wouldn’t be camouflaged. They are a major food source of the snow leopard. The males are larger than the females with much bigger horns. The species is hunted by humans, but this doesn’t have a significant impact on their population numbers. 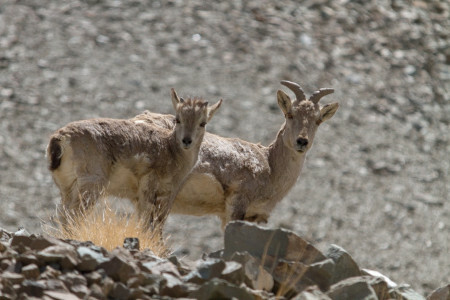 The main threat to the Bharal is competition with livestock for food.